Sunshine Montessori is a preschool, kindergarten and child care center conveniently located in the heart of Beaverton, Oregon. 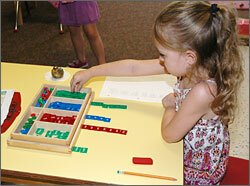 We offer a structured education program for 2 to 6 year olds that excels in preparing children for 1st grade and beyond. To help working parents, our facility is open Monday through Friday, 6:30am to 6:00pm year round with before-school and after-school care available. We are located near Nike, Tektronix, Intel and many other companies on the west side of Portland. Meals are prepared on premises and the children get frequent exercise in our large fenced playground with play structures, a tennis/basketball court and covered play areas. 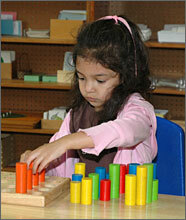 We closely follow the Montessori Method. All of our qualified teachers have diplomas in the Montessori Method of Education from either the Association Montessori Internationale or the American Montessori Society. Our teachers work closely with the rest of our staff to foster a caring, nurturing environment where kids thrive. Our owners are also very involved in teaching and with the management of the school. Sunshine Montessori was started in 1995 as Good Shepherd Montessori in Downtown Beaverton and quickly became a very sought after and respected preschool and kindergarten in the community. To serve the growing demand, the school was relocated to the present (larger) location in 2004. Our sister school, Mayflower Montessori, was opened in 1999 and offers an infant program in addition to toddler, preschool and kindergarten programs. We believe that each child has a natural desire to learn, to explore, and to take part in the world around them. 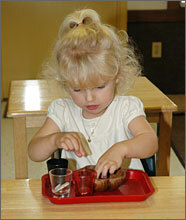 We nurture this desire following the principles and practices established by Dr. Maria Montessori. Our classrooms contain a prepared environment and special materials designed to develop and reinforce the child's independence and encourage their intellectual, social and behavioral development. Each child is treated as an individual and allowed to learn at his/her own pace. 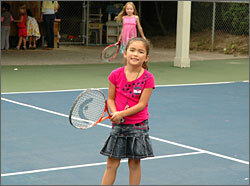 Through this approach, the child develops self confidence, responsibility and a love for learning. Recognizing the importance of a child's physical / large motor skills development, we have created a well-equipped play area, including a tennis/basketball court. 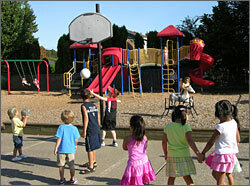 When weather permits, children are encouraged to play outside during their play times. We also have covered play areas so the children can play outside when the weather isn't optimal. The outside play areas are fenced and the toddler/infant play areas are separated from the areas where the older children play. We provide separate quiet nap areas for children (including preschoolers) who are still taking naps. Cots/mats are provided and bedding materials are washed at school each week. Our school has a well-equipped kitchen and a trained staff to prepare lunch and snacks. The balanced menus (posted weekly in the school office) are based on USDA and state regulations and guidelines. Special food needs (whether because of allergy or religious reasons) can be met on an individual basis — please let us know.